Occasionally, I find myself spending an inordinate amount of a day or two around about my cluttered little nook in the sun porch looking at old maps. Any of you get into serious map reading? It is an occupation-slash-hobby that can become very time consuming. Well, I find myself spending a lot of free time staring somewhat blankly at and going back over and over them 'til the wee hours of the night, again and again and pondering... yet again.Then one is required to check the area on the ground to gain a better perspective or little more is to be learned. Now, to get right to the point, I noticed something more than remotely unusual on a particular old map. We'll get to that soon and you can decide for yourselves. I had already observed what may well be a 'TFR' (Turkey Foot Road) remnant and where the Braddock Road may well of crossed this antique road at Walnut Hill in Upper Tyrone Township of Fayette County, PA. 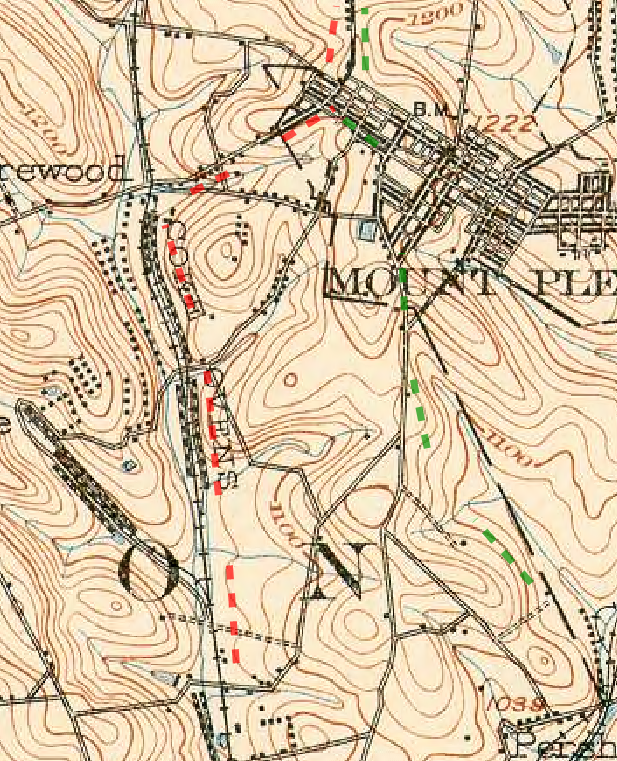 The decision was made for a future presentation concerning the route of Braddock's Road southeast of Prittstown as well as a projected route from observations of the TFR from Wooddale toward Kingview and Dexter Road to the northwest, consequently, for all intents and purposes, crisscrossing from the other direction. With the notice of this peculiarly marked map, thereby I found myself planning a brand new post, doubly exciting. Hopefully, we can make more sense of the whole situation, which as far as I am aware, has never been properly documented. There are quite a few links to help fill the knowledge base of this subject. I add those for that very purpose, and though this may seem a distraction, they are necessary to get the full picture. You can take the time to click these now. On the other hand, if this appears a little too much to grasp at one time, please come back to the site later and check these links after reading the main post when there is more free time. Once we are brought forward to this update in what I theorize was a 'high ground', fairly direct route of the Turkey Foot Road near Upper Tyrone to Mt. Pleasant and East Huntingdon Township, the plausible insinuation that alternate routes were developed and others partly abandoned, soon there appears a complication in referring to the routes of the Braddock Road and the Turkey Foot Road in this region. One aspect that might be a significant factor is there are indications the 'BR' was used longer and more frequently south of Jumonville and Mt. Braddock as the forerunner of the National Road to Brownsville and thus led to the popular route past the Monongahela river, thereby, as I am led to understand it, the remnants north in Fayette and Westmoreland counties were less used and more quickly abandoned and forgotten. This should be kept in mind. Consequently, we are in need of fresh documentation in our modern age of this locality. The internet is as good a place as any to be found. As an example, this has been succinctly noted, although in book form, in "A Hidden History Of The Laurel Highlands", with the observation there is a patchwork research requiring further investigation in archeological field work. I would enthusiastically echo the suggestion that property deeds are in urgent need of examination to attempt to clarify the more exact routes of these important historic roads. Soon after this, I stumbled upon other info altogether while checking on Norman Baker's dedicated book on the Braddock Road and various historical descriptions. This took place while trying to follow up on research supplemented by the precise author, Lannie Dietle. 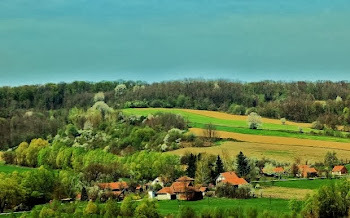 If you recall, it was he that provided relevant material for the Iron Bridge article last May and earlier in February of 2014, a guest blog post on the Turkey Foot Road and also providing an in depth interview segment in September. A few others chimed in with e-mails and some thoughts of their own as well. During our search late last year for an antecedent of the Turkey Foot Road with Jeff Hann, Mr. Dielte made the reassuring statement that, to a point, the idea of the Turkey Foot and Braddock roads crossing in this region is a "plausible theory" of mine. Frankly, this provides me with a hint of being on firmer ground and this cautious researcher's vote of confidence was a real shot in the arm. My friend and colleague, Mr. Dietle, also recently reminded me of Franklin Ellis' book, "History Of Fayette County, Pennsylvania" where there is a reference to a 1788 petition for a 'Road from Zachariah Connell's to Isaac Meason's, on Jacob's Creek'. It appears plausible this was concerned with the 'great road' from Connellsville to Greensburg, later often called the Mount Pleasant road, and rather misnamed 'old 119' traversing what became known as the Iron Bridge and its small community. There was also a 1783 petition. This does add a depth of further perplexity considering why the Braddock and Turkey Foot routes did not travel the more direct route through Pennsville, specifically the Iron Bridge crossing on the Mount Pleasant Road, but would allow for a better explanation as to why the old famous roads were soon abandoned. Secondly, I would also like to include a minor, though important contribution of my brother Scott, who helped orient me somewhat early on as to the positioning of the terrain and geography of the region. The truth is, though he doesn't really use the computer and may never see this, a hearty thanks for some credit is due for his input in this area with helping me get a tighter grasp on things. 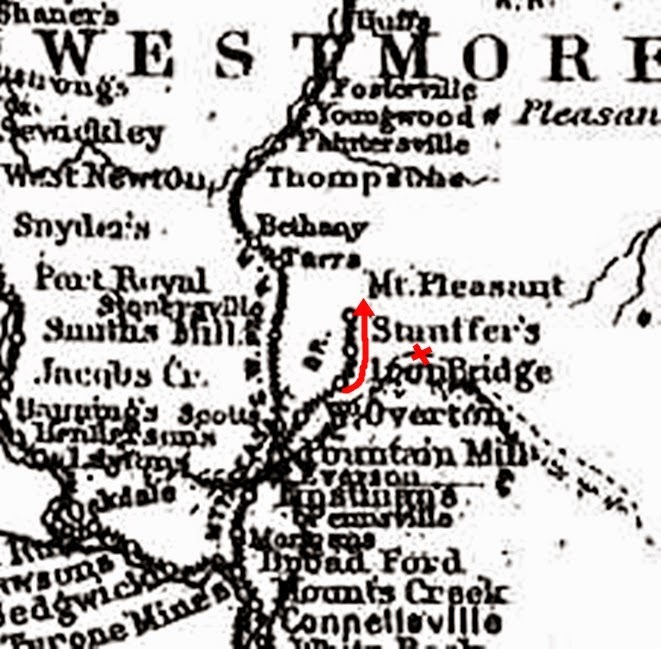 Quite possibly, the laborious efforts undertaken in the mid to late eighteenth century by these military men of note to find the best way to cross Jacob's Creek and avoid as much of the old 'Great Swamp' may well of had the effect of creating different usages of three roads through this key place. Added to this is the estimated minor branches of the traditional Indian Catawba Path that is said to run near Rt. 982 in Bullskin township from the Stewart Crossing at Connellsville toward Laurelville. And yet, there is rumored a branch of the Catwaba Path that ran near Everson to the Walnut Hill region followed by George Washington and Edward Braddock's army in the French and Indian War and cut and cleared by them. This hasn't been proven. This much of a claim toward Indian paths still allows some indications within the realm of reason that might of first led to the round about routes being advanced near the townships of Upper Tyrone, East Huntingdon and Bullskin. At the present, the exact details involved in the actual roads through Walnut Hill, Prittstown and on near to Mt. 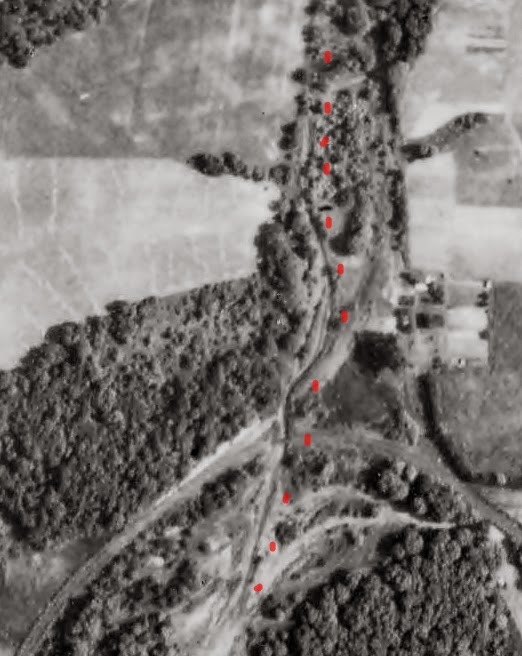 Pleasant are in many ways unknown with only basic reports and descriptions, like Orme's journal and a few maps acknowledging Braddock's traditional route and research on the Turkey Foot Road in Fayette County providing some evidence. Oh, some books have been written and Laycock once fleshed out a good deal of Braddock's route, especially to the south, but much has yet to be decisively understood and proven. What is noteworthy, for this post we are dealing soley with the region a few miles to the NORTH of Iron Bridge and a mile to the southwest. So, in essence, I honed in on various maps, and a few choice books, modern and old, whatever I could get my hands on, admittedly obsessed with the subject. I have already done some research in East Huntingdon about the lost toll houses of Route 31 which coincides in a round about way. That investigation produced little in the way of historical satisfaction. This is now a private road following the old rail bed and a likely route of the TFR and possibly an unknown branch of the Braddock Road, which will be shown later by the Barker Map of 1858. The next photo illustrated is looking southward toward Iron Bridge from Turkey Path. 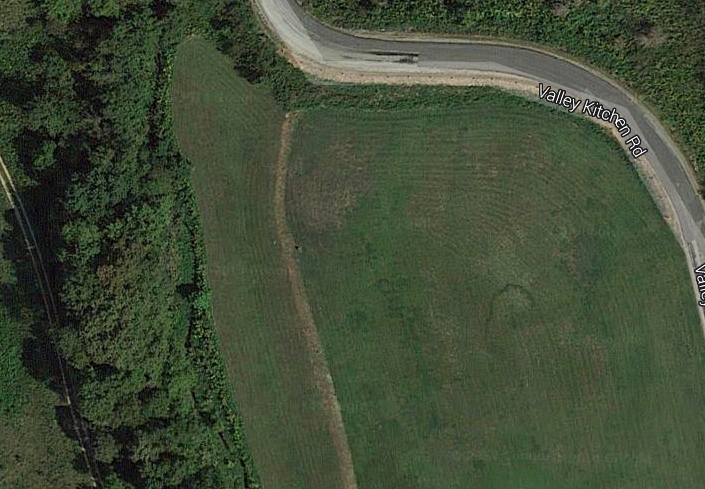 Courtesy of Google Maps, the above mapping marks the exact spot close to the old PA railroad spur where the Turkey Path Road was bridged crossing what is known as Sherrick Run to the Mt. Pleasant Road, (sometimes called the Pennsville Road and further to the south, the Richey Road). It is hardly a coincidence the railroad used this old route. Unfortunately, to history buffs like myself, the old bridge has since been removed. The Mt. Pleasant Road use to pass through Connellsville before the Interstate Rt. 119 four lane was built in the 1960's. It now ends near the Greenridge Cemetery where it use to continue into Moyer. The Emma Mine, (named after the youngest daughter of one of the Overholts), and the Bessemer Mine and coke ovens were on the direct route from Turkey Path to Morewood, obfuscating any possible remaining historical evidence that much more. 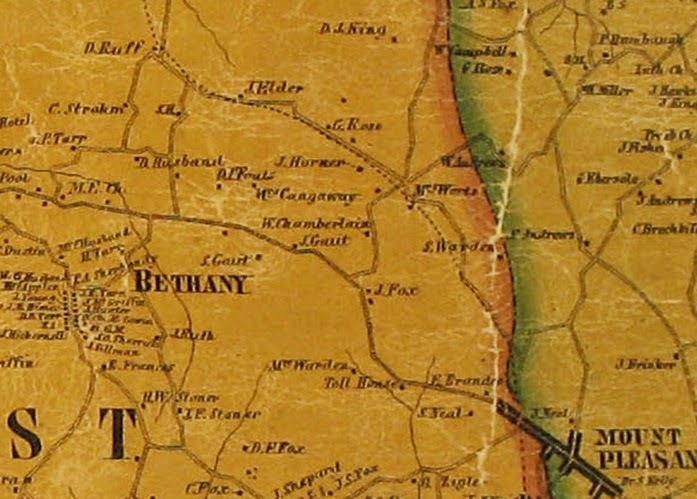 Interestingly, the case can be made for a load of intrigue, since the Westmoreland County Barker Map of 1858 DOES NOT refer the traditional Braddock Road, but for a small region, the Fayette County Map of the same name does appear to have the township line heading east to where the Braddock Road is believed to of gone past Prittstown. This is not noted on the Westmoreland map. Again, here is a real historical mystery that is unexplained and difficult to comprehend! While making no heavy claims of any particular expertise, I realized that this was once the basic route of an old part of the Broadford and Mount Pleasant Railroad. 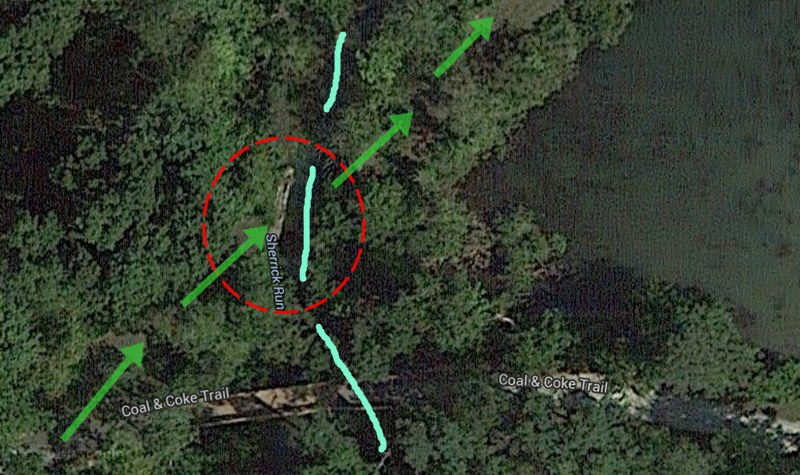 My theory relates to the route later used by the tracks of the Scottdale Branch of the PA R x R and on past Iron Bridge from north of McClure traversing to near Iron Bridge laid on or near a suspected branch of the Turkey Foot Road. The old spur is obviously not in existence anymore, at least this incarnation with the tracks to Morewood, which are long gone. Heavily industrialized, this region is being further modernized with newly routed paved roads from Rt. 819 and ramps for the 119 four lane highway. It is known the railroad traveled up through what is known locally as 'Turkey Path', receiving the local name because of a tradition the turkeys were driven to market at Mt. Pleasant back in distant times, making it doubtful, name wise, for possessing any connection to the Turkey Foot Road.Reaching Rt 31 it appears to of crossed over to the old 31 road and to the north beyond near what is termed a continuation of 'old 119'. 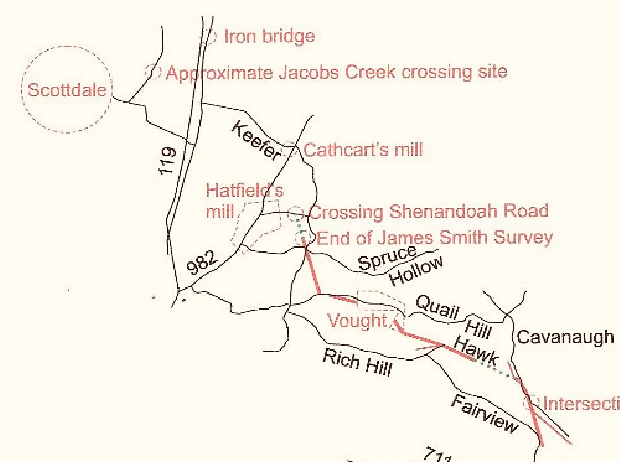 So, to the north of Iron Bridge the Turkey Foot Road, (not the Turkey PATH), could easily of paralleled Sherrick Run, which empties into Jacobs Creek at Iron Bridge, while the railroad did just that. It could be speculated there was once a need of clean, fresh water source and to that end, this small creek might of possibly suited their purpose. Following the lost tracks and the creek north toward Morewood where there was much strip mining activity and coke ovens in the 19th century, the railroad ran past Rt. 31 near where an old toll house was once located farther to the north, outside Mt. Pleasant, near to Valley Kitchen of the Old Glade Path. This railroad remnant could be a plausible and maybe probable connection to the TFR, or 'Old Braddock Road' route. 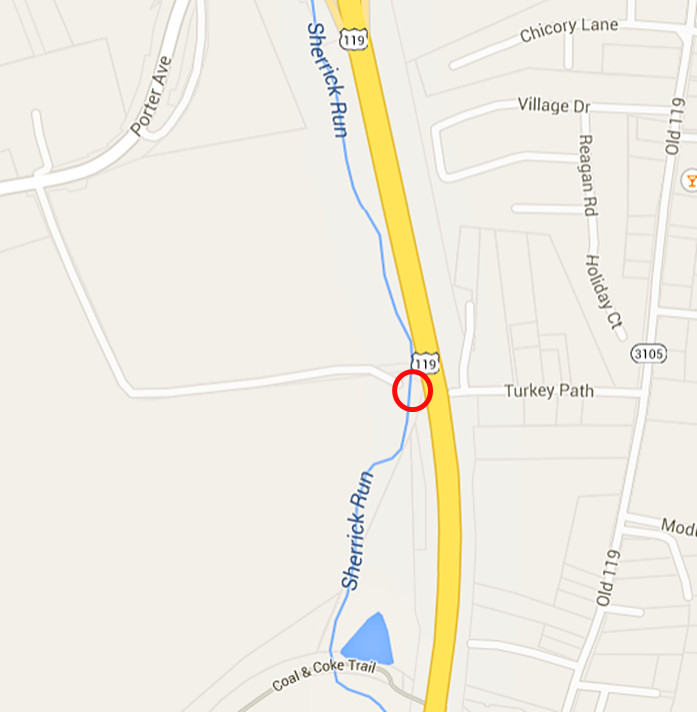 Lannie Dietle has theorized an alternate route of the Turkey Foot Road as going partly in this direction. For this reason, I thought it well to relate his speculations should be briefly referenced. There is more material I am currently in the process of investigating in my own quiet way. So, this is a work in progress. At the present time some estimates must necessarily remain partly in the realm of supposition, as the ideas in this article would need more confirmation and corrections to be further verified. If, in some definitive form, the proper material for vindication can be found, the rest of this research will be promptly passed on to YOU. Of course, we are also dealing with areas of private property, which I might add, of necessity must always be taken into account. :But, I am now getting ahead of myself. As I was becoming more and more intrigued, I conjectured of the former state of this railroad track and the road it once contained and more so, the route of this map claim of the Old Braddock Road. 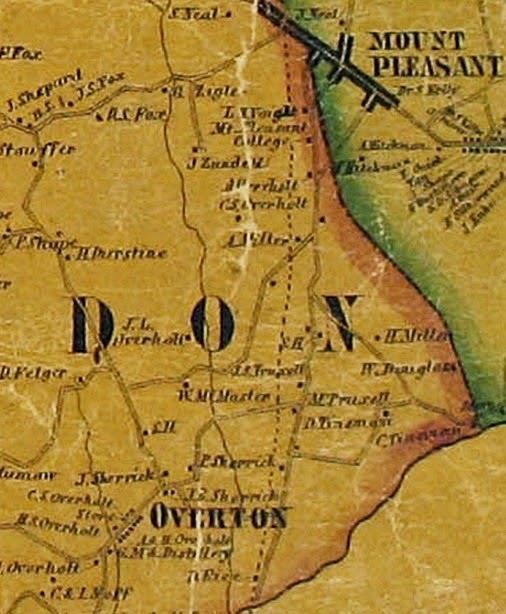 Locating the area on the East Huntingdon section of the 1858 Barker Westmoreland map, I quickly discovered something truly most perplexing. By the projected schematic markings, and I should again state, the absolute lack thereof of the traditional Braddock route! Absolutely nothing is noted from the west near Hammondville in the corner of Bulskin township and Mt. Pleasant at all on this very map, but apparently from where you would expect to see the Turkey Foot Road remnant, leading me to wonder about the old and new routes used by those people that were intimately involved in the road making and how William J. Barker of Philadelphia deduced this supposed route more than half a century later than the clearing of the Turkey Foot Road and a century from the cutting of the Braddock Road. Should this be so befuddling to my sense of comprehension or not? Maybe there was some unfactored error in judgement and I am at fault, as I am capable of mistakes. This hardly seems to be the case here. There is a clear route marked for Bouquet and the traditional Forbes Road to the north which can be directly observed on the map. Granted, it appears to be accurately depicted. Is this subject discussed in depth in historical publications, something I am simply ignorant of? Possibly, but until this entry, I am not aware of any definitive research of any caliber. Of course, this is near the Bullskin township, Upper Tyrone and Mt. Pleasant lines here, as well. Was this just a blunder by someone that did accurate work mapping the many other conspicious areas of these counties in such proper detail? And does this seem a doubtful, unsatisfying explanation? That I do concur with. There might be a mention in an obscure, little known book or newspaper article, possibly some dusty periodical, as an inference of such a conundrum and would keenly welcome anyone with credentials or proper information to enlighten us as to an alternate meaning. I would openly relish a meaningful and logical explanation addressing all the potential conflicts. This might give some kind of convoluted, maybe garbled route of the Turkey Foot Road following a later branch of the Braddock Road. The map strongly suggests this was once related to a part of the Braddock Road. It would seem to be a plausible forerunner of this small stretch of the Mount Pleasant Road. The problem is, it is marked on the map as "Old Braddock Road" still leaving us in the dark as to how this route was named and took precedence over the traditional route agreed on to the east. Wasn't it Judge Veech himself that said tradition held it was the Turkey Foot Road that went past Stouffer's Mill at Dexter? This could help explain a piece of the mix up, simply because an historical mention of the 'BR' doing so is not known, or at best, lost to posterity. The enigma is indeed of historical significance and it may be beyond finding an agreeable solution with the knowledge and information provided. I have considered purchasing the warranty and patent books to investigate further what tracts this was on, and that could be a real plus, but an expensive one. That wouldn't necessarily solve the dilemma, anyway. What we have from Barker, and the original in the Library of Congress, if you follow it along into East Huntingdon, and through Hempfield and North Huntingdon townships is written as "Old"..."Braddock"..."Road" in bold black type face. I've shown the three words together here for the sake of clarity. Alright folks, there you have it, my 'Scoop' on the Barker Maps and the Old Braddock Road. I feel this is an interesting, but imperfect and incomplete acknowledgement that leads indirectly to the notion of the 'TFR' joining up with the 'BR' near Sand Hill Road at Mt. Pleasant from the south and so it continues the whole way as the traditional route toward Turtle Creek, Braddock's Fields and Allegheny County. 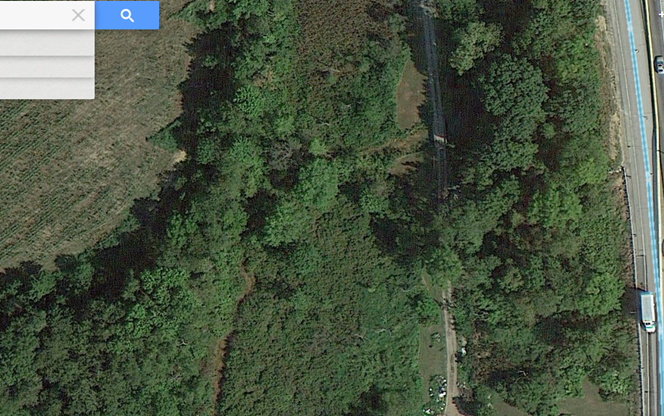 This has the appearance of a possible confusion between the two famous roads, perhaps for good reason, perhaps not. It might depend on how one views the information on these particular maps with the known routes the roads traversed. In my estimation, the enigma of the lack of Braddock Road markings below Mt. 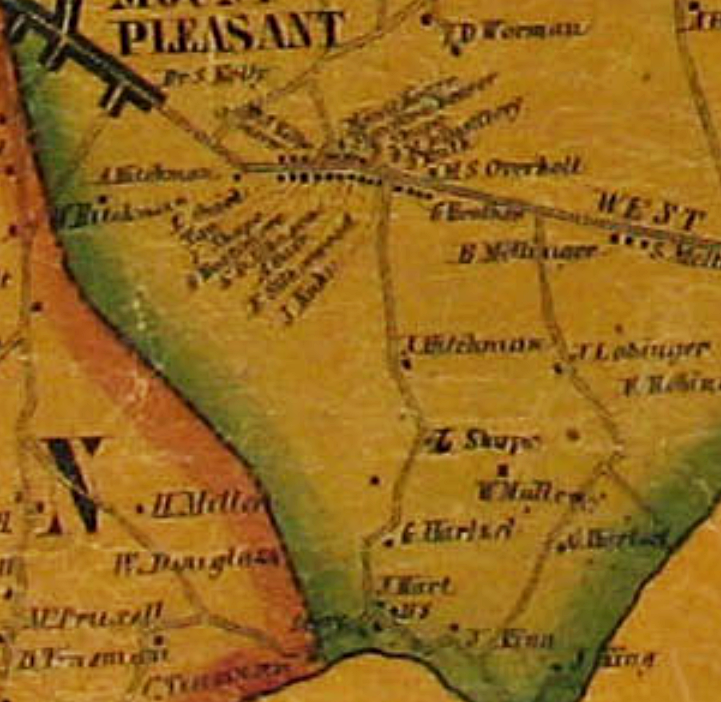 Pleasant will probably remain a perplexing and odd footnote of our regional history and map making in general. One idea that makes some sense is that the older route to the east was quickly abandoned and generally forgotten many years before the map was produced, so this alternate route was then thought of as the legitimate remnant of the 'BR' because this old road was still in existence. Yet again, it should be obvious this subject deserves special attention from scholars and hopefully those with all the sources at their fingertips will eventually investigate this deeper and provide more illumination than has been done so far. At the least, we appear to be looking at a lost tradition of an alternate form of the Braddock Road.This may well be based on a route of the Turkey Foot Road instead. As related in my excited post of last November on my discovery of an enigmatic bridge structure, on the south bank of Jacob's Creek in Upper Tyrone which is officially unacknowledged by the railroad, of blocks of stone without any evidence of mortar, an old wall and a fording site heading in this general direction from the Dexter area a mile to the south, I now feel more strongly this might add some creedence to that theory as well. On a personal note, this was a thoroughly enjoyable, though puzzling exercise, in investigative research important enough to document as well as could be managed with the limited resources available. A certain amount of info might seem to be missing from this post and these deductions and may be marred by a less than complete analysis. This is to be expected and, under the circumstances, is an unavoidable reality in relation to the nature of the known facts. Otherwise, the situation has been presented here well enough to garner some repute toward the expectations of encouraging further research and should at present be better defined. In the main, this was all that was being attempted and surely the key points are, as of now, sufficiently brought to the attention of the public at large for the time being. If the reader is not a regular visitor to this blog, please note that further evidence has recently been gained in the Bullskin township region. Check out my other revealing posts, "The Forgotten Turkey Foot Road in Bullskin Township", "Turkey Foot Road Remnants South of Quail Hill..." and "The Braddock and Turkey Foot Roads Near Walnut Hill with added Information." If you're intrigued, more on Morewood is available, just click on the link. Thanks for looking in on this fascinating subject. This was literally, "around the bend" and "down the road"! In the long run, make of it what you will folks and I hope you found it interesting and a worthy contribution.